It has been a while since we spoke. Our gang is back to 2, our problems with Shila did not get any better. In the end we found her a great home. She is alot happier now by herself. 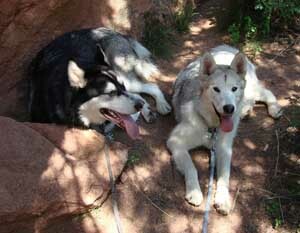 I have a couple of pictures of Nanuq and Siku at the Garden of the Gods, where of course they were as big an attraction ! 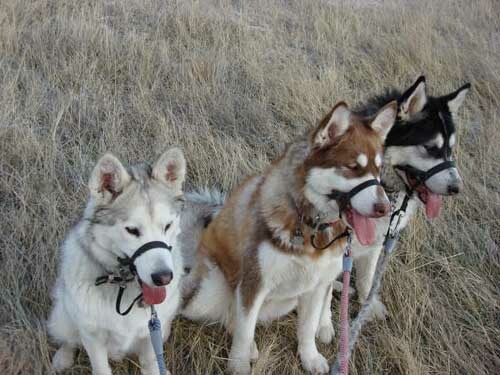 A cute picture of the three amigo's, I think they were prairie dog watching! They are all doing great, shedding like crazy.. the birds love our back yard with all the fur laying around ! Shila is catching up to Nanuq in size , I think she may end up bigger than her once she fills out and get's out of the gangly stage. 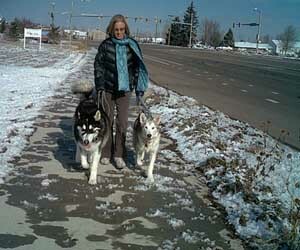 We are supposed to have a big snow storm this weekend , got to love CO weather 70's all week then up to 3 feet of snow! I think the only ones that will be happy are the dogs! 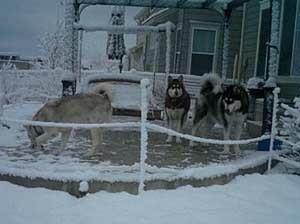 I will get some pictures of them going snow crazy if it does. This picture is so cute ! 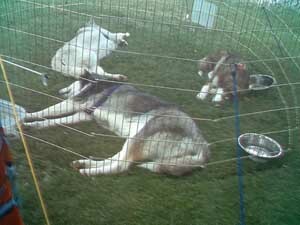 Nanuq and Shila snuggled together with Siku eating his cow hoof! Thay are loving the cold weather and snow we have right now. 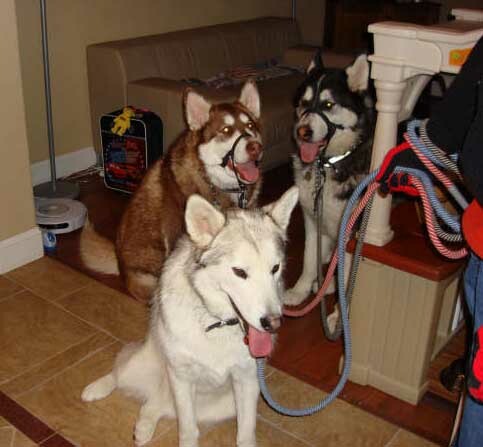 Here is a picture of the three doggies waiting to go out for a walk. 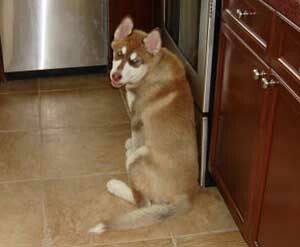 Shila has now turned 1 weighing in at 123lbs. 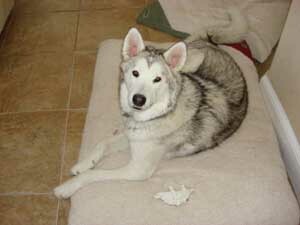 Nanuq who is nearly 2 is now 145lbs! she is solid muscle........ and still the biggest baby ever. 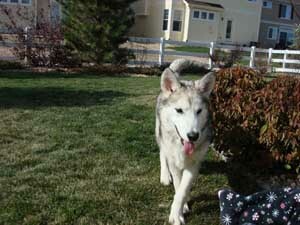 Siku is our light weight at 90lbs and can out run the girls easily. 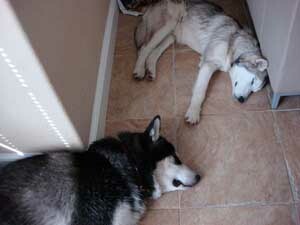 When Ed runs them he is still up for more after 7 miles, Nanuq just sleeps for the next day ! We are starting to run Shila now that she is a year old, she hates the scooter; not sure why as the other 2 love it. I just keep making her go in it and she will learn eventually that it is fun. 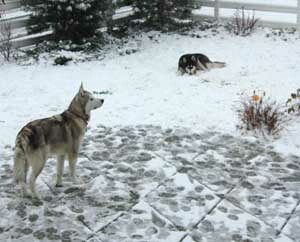 We had a few snow falls in December and Shila slipped playing and broke her toe! I thought she must have broken a leg the way she was acting....... she is so vocal, she is our talker; we sometimes call her 'Chewy' as she sound like Chewbacca off Star Wars. Things here have settled down and back to normal. 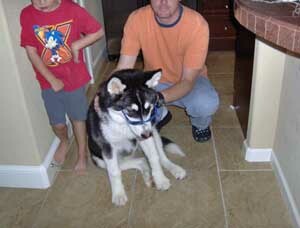 I still don't know what was up with Nanuq , any way she is back to her normal self. Shila got to see her first snow... 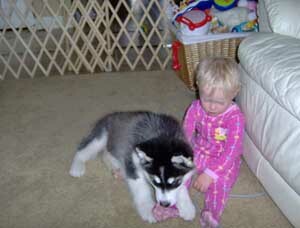 I think she will end up bigger than Nanuq , she is such a sweet heart. She thinks she is a lap dog ! 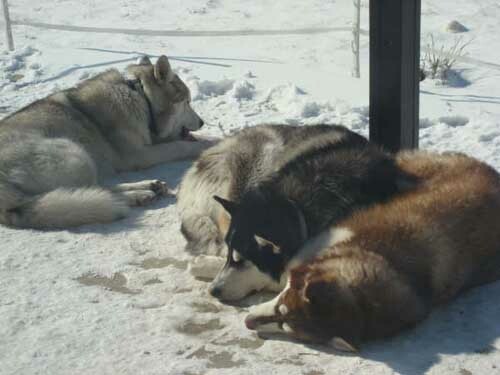 Ed took all three out for a run in the snow last night, I think he came back more tired than they did. Here are some pictures taken yesterday. Shila is now part of the scooter team ! She did great. 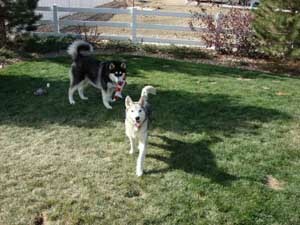 The cold weather is coming and they are loving it, much better for them to run in. 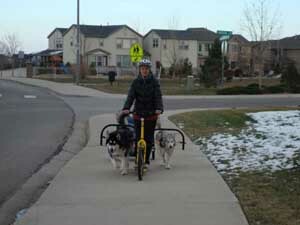 I had to change Nanuq and Siku around on the scooter as Nanuq is so long Shila could not fit behind her, as it happens Siku is actually the best lead dog. He really kept the girls running. Thought I would send some pictures of the doggies ! They are all doing great. 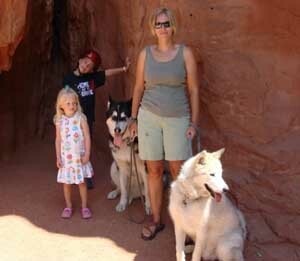 Nanuq is 1 and 1/2 now and is 132lbs , Siku is just under 1 and 1/2 and is 100lbs, Shila is 6mo and is 65lbs. All 3 still get along great. 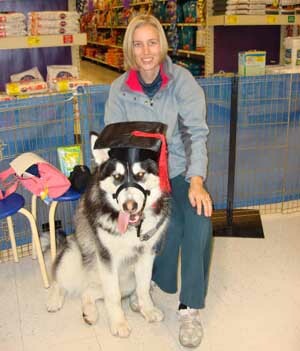 Shila is just completing basic training and is very smart like Nanuq. Siku is a lot slower to catch on in training than the girls. 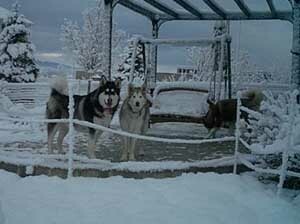 I am thinking about taking Nanuq to agility over the next winter and maybe Siku. We have just come back from vacation and they had a great time. All three loved sleeping in the RV with us! Every one commented on how well behaved they were. A couple of pictures of all three. Shila has finished kindergarten and starts training next month. She is 45lbs now and starting to shed her puppy coat, she is looking really dark red underneath and not wooly like we thought. 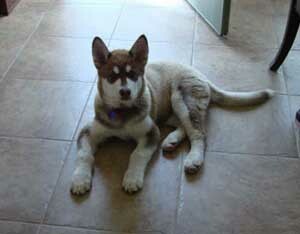 She is a sweety not like Nanuq at all ! 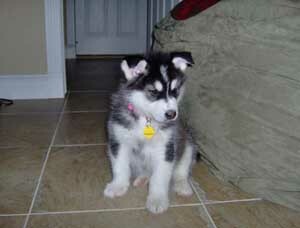 (not that Nanuq isn't sweet , in a braty sort of way!) 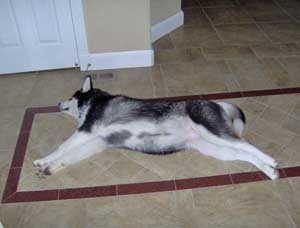 Shila is laid back very like Siku. Potty training has been very easy too. 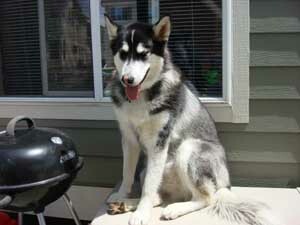 Nanuq is now out of coat FINALLY ! She has turned Grey, she looks like a gangly teenager ! Siku's coat hasn't really changed he is still very wooly but is soooo silky soft. The three still are very much in love and very attached to each other. It is the end of the world if ones goes away from the other two. Every day they have a howling session that lasts about 1 minute, luckily most people don't mind! 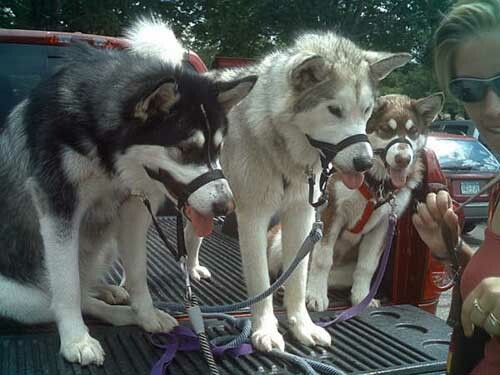 They haven't got much choice as it is so loud and it is always Nanuq that starts them off. 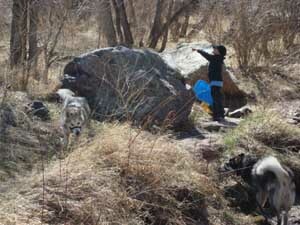 We will be starting camping again at the end of this month and taking all three with us. 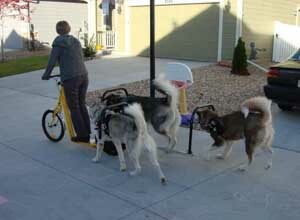 Nanuq used to sleep with us but I don't think all three will fit in the trailer! We have got them a portable kennel / run so they can sleep outside together. A couple more pictures of the gang. We had a great day up in the mountains . Shila managed to escape all the pictures! 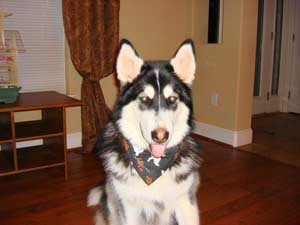 Just thought I would send some birthday pictures of Nanuq I can't believe she in now one. I weighed her last week when I went to petsmart she is 117lbs. We met Sikari there, Nanuq was really good with her, she gave her a paw across the head a couple of times to try to get her to play then gave up and lay down to let Sikari come and see her. Siku is doing good and his coat is starting to grow back in thank goodness! The vet could have shaved him a bit better. We can't wait for Shila to come and make 3! The babies are still very much best friends . 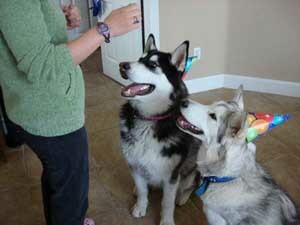 Nanauq is now weighing in at 103lbs at 10 months and Siku is 55lbs at 8 months. 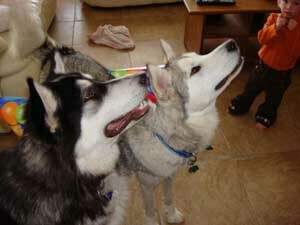 Nanuq just completed her intermediate training last night and Siku is half way through his beginner. 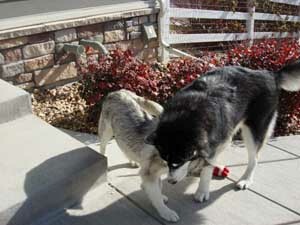 The Colorado weather is perfect for Nanuq, she 'snow bathes', Siku however prefers being warm ! 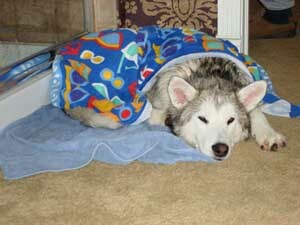 The picture of him is after he came in the shower with me to warm up! Siku is GREAT! He is such a lover ! 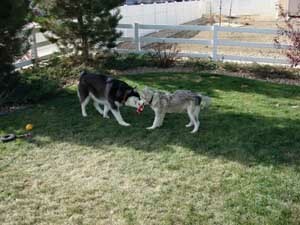 The two still love each other, Nanuq is the leader but they seem to have figured that out straight away. There has not been any 'arguing' between them which is great. Siku starts his training tonight which I am excited about, I get comments all the time about how beautiful they are and how well behaved. They both are loving the cold weather and the snow! 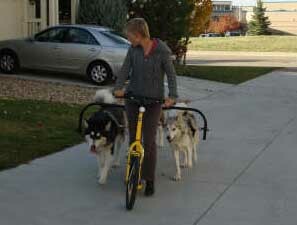 We have got a dog powered scooter for them. 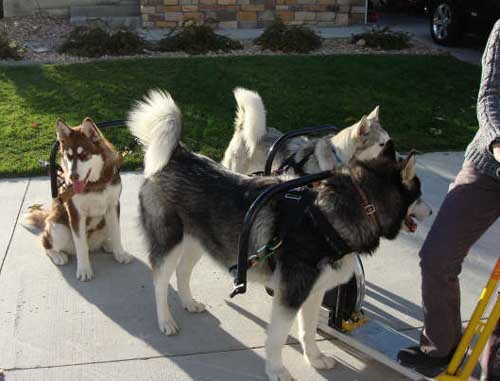 They each have a harness that attaches to a scooter and the get to pull me! It's great, they love it and they get a good work out. I will send some pictures of them at work when I get Ed to take some! 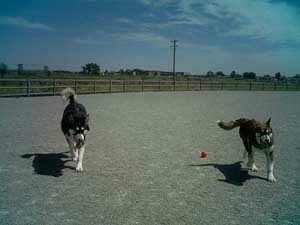 They are normally so exited to get going we don't get the pictures in time. 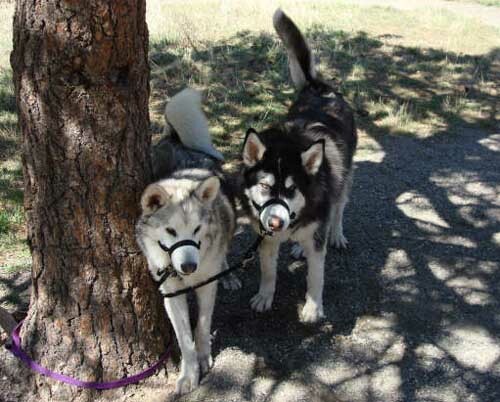 Nanuq and Siku are doing great ! It has been instant love......... He is so sweet , it has been a great match. I have sent a couple of pictures of them, they love to play tug with Santa, I don't think Santa is going to last much longer ! Thanks again for another wonderful dog. She is almost 8 months now as is 90lbs. She is the most amazing girl ! We have completed puppy kindergarten and basic training. We are now onto intermediate training, my goal is advanced and then hopefully take the 'canine good citizen' test. Everybody in the neighborhood loves her, they all stop by when she is out with us and she flops straight over to have her belly rubbed. Her favorite thing, apart from eating is coming camping with us. It gets cozy with our 2 kids (5 and 19mo) and Nanuq in a travel trailer, when she lies out full length she touches each side ! 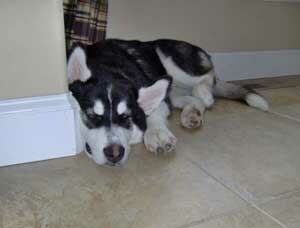 We have finished puppy kindergarten and she was the star of the group, she is very sociable. We are now onto basic obedience and she loves it. 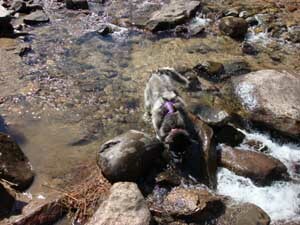 We have has a hard time with her food , every thing we tried gave her terrible diarrhea. Eventually we had to put her on a low residue prescription diet, this seems to suit her stomach for now. 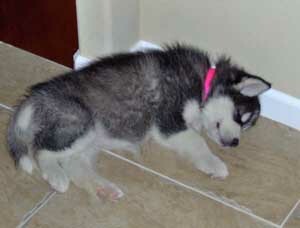 I have attached some pictures of her. The one with my daughter is about one month ago and the other two are about 2 weeks ago. 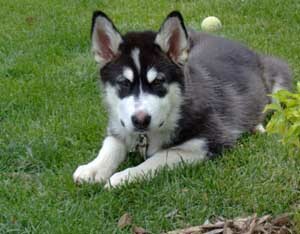 Thankyou for our wonderful puppy.